H​ow was the Salton Sea formed? Ancient Lake Cahuilla arose in the Salton Sink when the Colorado River silted up its normal egress to the Gulf of California and swung northward through two overflow channels. The Salton Sink is subjected to wet and dry climatic cycles over intervening years, filling up and drying out four times. The Salton Sea is a terminal sea meaning that it has no outflow. The present filling of the Salton Sea occurred in 1905 when the Colorado River flooded into the Salton Sink due to extreme flooding that year. Subsequent to that event in 1905 the Sea’s level has been maintained at roughly its present elevation of -232 feet by agricultural drainage and tail water from the Imperial and Coachella Valleys. ​H​ow much water evaporates from the Salton Sea annually? The total evaporation from the Salton Sea is approximately 1,300,000 acre feet of water per year (this is a variable rate dependent on sun, wind, temperature etcetera). The total volume of water in the Salton Sea is approximately 7.5 million acre feet. 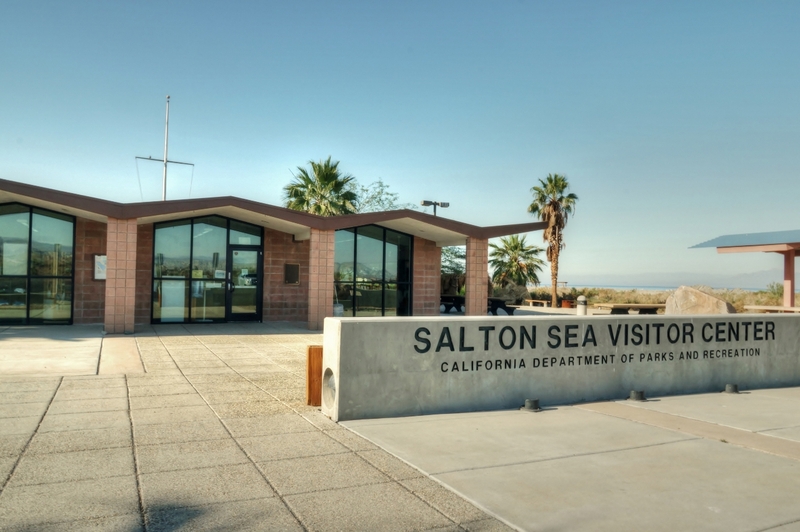 As stated the Salton Sea contains approximately 7.5 million acre feet of water. It is 51 feet deep at its deepest point in the northern half. The surface area of the Sea is approximately 343 square miles and it has about 110 miles of shoreline. The Sea is about 35 miles long and about 15 miles wide. It is the largest inland lake in the state of California. ​H​ow much salt goes into the Salton Sea every year? 4,000,000 tons of dissolved salts enter the Salton Sea every year. That is the equivalent of approximately 13,500 train cars. The salt comes from agricultural drainage and tail water and the Colorado River itself. How Salty is the Salton Sea? The Salton Sea is approximately 60 parts per thousand (PPT). By comparison ocean water is approximately 35 PPT. The salinity of the Sea increases every year. As the Sea evaporates every year all of the salt delivered to it is left behind thereby increasing the salinity with each passing year. How many fish and what kind of fish are in the Salton Sea? Soon after the Salton Sea formed in 1905 many types of fish were stocked into the Sea for sport and commercial fishing purposes. In fact the Sea was a major sport fishing destination for nearly 60 years. At the beginning, the Sea was not salty and would support many different types of fish. As the Sea reached salt levels similar to the ocean many ocean species were stocked into the Sea as well. The salinity has unfortunately reached a point where it is assumed that the only species of fish that presently inhabit the Sea are the algae eating tilapia, that were introduced into the All American Canal for algae control in the 1960s, and the endangered, indigenous pupfish. The tilapia have managed to adapt to the high salt levels however scientists believe that the salinity is reaching a tipping point where even the tilapia will soon have a massive die-off. It was estimated in the 1990s that the Sea was home to millions of tilapia. How is the Sea filled today? The Imperial Valley, and to a lesser degree the Coachella Valley, produce agricultural drainage water from hundreds of square miles of irrigated acreage. Most people do not realize that in addition to providing irrigation water to farming in both valleys the Bureau of Reclamation also constructed an intricate network of drain tiles to carry off leached and tail water from farms. Because Colorado River Water contains salts it is necessary for farmers to over irrigate their land in order to remove those salts from the growth zone of plants. If the salts were not leached through the soil the farms would soon become unproductive. This leachate, or tail water, as it is called is carried to the Salton Sea through the drainage system. When the All American Canal was built water was cheap and plentiful. The Canal itself was unlined as was most of the delivery network of smaller canals. These unlined canals also produce excess drainage to the Salton Sea. The combination of these drainage sources of water along with drainage from Mexico has been enough to keep the Sea reasonably maintained at roughly the -230 foot elevation. In other words in-flows have equaled evaporation. That is about to change dramatically. Why is the Salton Sea shrinking? Over the last 75 years water has become much more scarce and expensive do in part to urban development in the southwestern states that rely on Colorado River Water. As a result farmers have become much more efficient in their use of water. Improved irrigation techniques and varieties of crops have dramatically reduced the amount of agricultural runoff. Additionally both the CVWD and IID have embarked on canal lining projects and other conservations methods that have reduced in-flows. As a result of IID’s conservation methods and the Quantification Settlement Agreement (QSA) water transfers to urban areas like San Diego will begin to significantly affect inflows starting in 2017. Significant acreage in the Imperial Valley has already been fallowed and is no longer providing irrigation runoff. Put simply, the in-flows no longer match the evaporation rate. It is estimated that in-flows into the Sea may drop to as little as 500,000 acre feet over the next two decades. The Salton Sea will need to be maintained on approximately one-third of its recent inflows. Why is the Salton Sea an important ecological resource worth saving? Over 400 species birds rely on the Salton Sea regional ecosystem. The agriculture around the Sea is also important to certain species of birds. One is dependent on the other. Migratory bird species depend on the Salton Sea as a major stopover along the Pacific flyway. In fact it is the second most Avian bio-diverse region in the North America, only second to the Everglades. Because of Wetland conversions in California due to urbanization and agricultural development 90% of the wetlands along the Pacific Flyway have been eliminated over the last century causing the Salton Sea to become an extremely important rest and feeding stopover for migratory bird populations. The loss of the Salton Sea as a fishery and stopover for these bird populations will likely result in impacts to these species of staggering proportions. These birds rely on the Sea for rest and sustenance. This is a problem of international environmental significance. If the fish die from hyper-salinity the birds will die as well. We must find a way to increase and maintain the fishery and the wetlands to save these birds. What caused the “Big Stink” in of September 2012? We have all smelled that nasty rotten egg odor emanating from a sewer, septic tank or port-a-potty. That odor is often caused by hydrogen sulfide gas. Hydrogen Sulfide (H2S) is produced when organic material breaks down due to microbial activity in an environment lacking in oxygen. The enormous amount of life and organic matter in the Sea creates this gas at the deeper locations within the Sea but that gas is sequestered in the lower depths of the Sea. In the summer when severe wind events from the Gulf of California move northwesterly they can cause waves and turbulence in the Sea to a degree that brings the Hydrogen Sulfide Gas to the surface where it is then carried by the weather to population centers. As the Sea continues to decline we can expect more big stinks. Who owns the Salton Sea? The land under the Salton Sea is owned almost entirely by three entities. The largest is the Federal Government. The Bureau of Reclamation and the Bureau of Land Management under the Department of the Interior own the lions share. Additionally a large amount of land under the Sea is owned by the Imperial Irrigation District. In the north, there is approximately 11,000 acres of tribal lands owned by the Torres Martinez Desert Cahuilla Indians and held in trust by the Bureau of Indian Affairs under the Department of the Interior. There are a few private holdings. The Coachella Valley Water District also has a very small amount of acreage. What does renewable energy have to do with the Salton Sea? The southern end of the Salton Sea is the richest source of geothermal energy in the United States and possibly the world. Our region is also one of the most prolific solar energy and wind energy areas in the USA with our nearly 365 days of sunshine per year. There is a possibility that the exploitation of these resources could provide funding for Salton Sea Revitalization and energy for the infrastructure required to operate and maintain the Sea. What will happen if the Salton Sea is just left to dry up? If we do nothing, (a scenario that is called the no project alternative), then the Sea will dry up to approximately one- third of its present size. The resulting hyper-saline lake will be a non-productive, dead sea incapable of maintaining a fishery and sustenance for the 400 species of migratory birds that depend on the Sea. The roughly 220 square miles of exposed playa will cause an air quality disaster of such enormous proportions that the valleys of Coachella and Imperial as well as southerly into Mexico may become uninhabitable. The agriculture of the Coachella and Imperial Valleys will be ruined and the economy of the Coachella and Imperial valleys will become non-existent. Beyond the Coachella Valley the remainder of Southern California will be impacted. What is Selenium and why do I hear so much about that in the news? Selenium is a naturally occurring element in the periodic table that is essential to life in minute quantities but has been determined to cause birth defects in bird species that nest at the Salton where the quantities of this element exceed save and effective levels. The issue of selenium sequestration from water entering the Salton Sea has to be a component of any Salton Sea revitalization alternative. What is the QSA and what is its significance to the Salton Sea? Can I take my boat out on the Salton Sea?